Vicky Ventura slot is based, well, on Vicky Ventura of course! She is a female explorer it seems, maybe the other half of the chap who appears on Book of Ra Deluxe? Who knows, but here she is venturing into the South American jungle which is in the background behind the Inca temple the reels are set across. We have some native pipe music gently playing as we spin with dramatic sounds when certain symbols land in view. These places can be dangerous for our cash as we have seen before with Aztec's Treasure and Mayan Gods, so can Vicky help us navigate the perils hidden here and awaiting our bankroll? There are 243-ways to win with Vicky Ventura slot, so we have 5 reels and 3 rows. You may notice there are more rows above the grid hidden behind stones needing a key to unlock them, but for the present let's concentrate on what we actually can see. For any 5-of-a-kinds the best is the Gold Compass at 15x your 20 coin bet, 7.5x Binoculars, 6x Hat, 4.5X Diary and 3x Map Scroll. 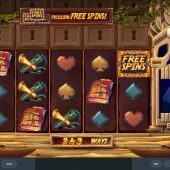 the other 4 symbols are card suits and all pay 1.5x for each full way of 5. there are Free Spins scatters on all reels but no Wilds, although we can get them created with the Totem Crystal! You may see one or more blue Totem Crystals appear. When this happens, you will get modifier and a guaranteed win. The first type is symbols on the grid converted to link up winning ways, or a Wild added to one or more positions on the locked row above the grid. This will create more ways for that spin, so if one Wild was placed over any reel your ways would increase from 243 to 324 for example. The last benefit is the revealing of more Totem Crystals to result in yet more energy beams landing on the grid and doing the same. So you can get any one, two or even all three of these enhancements on any single Totem appearance. You need 3 scatters anywhere to trigger 10 free games which are played with 2 rows of locked tiles over the reels instead of one. These can be retriggered too. If they are retriggered you get 10 more spins and then a third row of locked tiles will come into play, up to a maximum of 4 if you get a second retrigger. 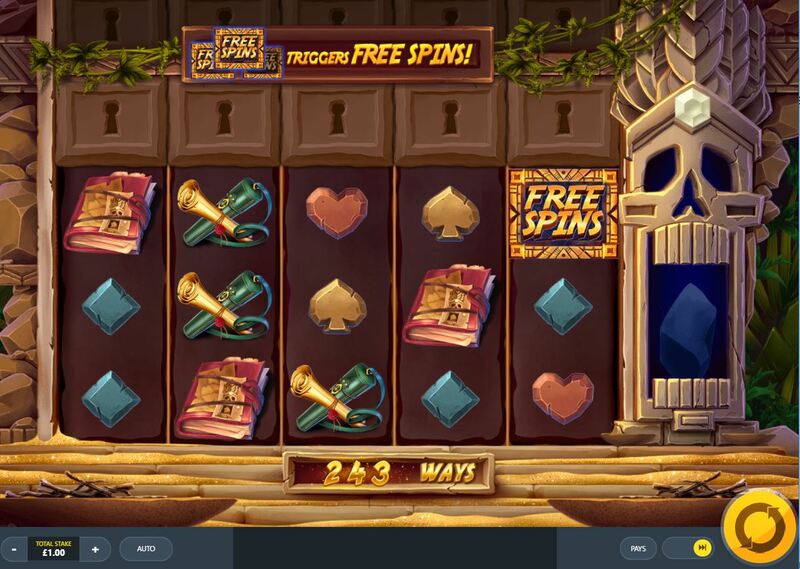 The obvious is true here - while in free spins you get far more Totem Crystal enhancements appearing, and presumably this is where you could see the maximum 10,000x bet pay the Red Tiger boast on the intro screen!